Viking women were skilled in many things and also capable of being just as tough as the Viking men should they need to be. A Viking woman would grow up just like a man, learning to live off the land, and be self sufficient, a truly important skill in old Norse times. Viking women were also treated with much respect by the men and also society in general. Whether the old Norse women would not tolerate anything less of simply whether they were respected so much by the men is not clear. Viking women had plenty of rights and privileges, including the option of divorce should her husband not treat her with the respect she demanded. 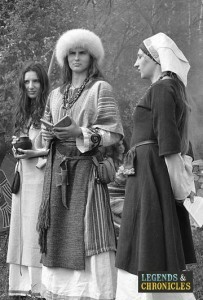 As we mentioned life for a Viking woman was really quite good, they were treated with a lot of respect and granted many privileges. The Viking woman was able to marry, to divorce and unwanted attention from a Viking man would not be tolerated. In fact if a Viking man was to kiss or try anything more with a Viking woman that was not willing, then he would stand to be fined or face more serious punishment. In this way the Viking woman was very well protected and highly though of in old Norse Scandinavia. A group of young Viking women. Women however were not involved in many aspect of Viking life. Women were not allowed to join raids or any trading ventures. They were also not permitted to do various things, like having a short hair cut, carrying swords, or axes, and were not allowed to dress as a man would. Many of these prohibitive rules were obviously to keep women in a certain role in Viking society. When it came to the matter of politics and the running of society, Viking women were thought to not have much say in the public forum. The women were not allowed to speak at meetings or gatherings concerning these matters. This however does probably not paint a fully accurate picture, Viking women probably had much influence in the running of Viking society, likely through a word in the ear of her husband or father. Women however were allowed to travel, they played a role in the colonisation of various island and lands, setting up homes and looking after their family and children in these new lands, like Iceland, Greenland, and islands off the coast of Scotland, England and Ireland. For a woman to be successful in ancient Scandinavia she would need to have a multitude of skills used in daily life. Cooking was one such skill, and the Viking woman would have to not only cook and prepare food, but to also manage the stock levels for the cold winters. Smoking fish and meats, making broth, baking bread and producing ale were all skills that would help a Viking woman keep a household running successfully. Additional skills like cloth making, fabric work and sewing and stitching were all necessary too. The Viking woman would get her husband to buy fabric and would make and cloth the family in the traditional clothing style. Keeping the family healthy was another important facet of a Viking woman’s life. While old Norse medicine was not as advanced as today, a Viking women would still make medicine, and tend to the ill should it be needed. Finally a women would also have to be adept at managing the farm. There would be times where her husband, or father would be away on trades or raids. The Viking woman would look after the animals and crops, or at the least manage the farm hands or slaves to ensure the farm was managed correctly. Marriage was not really an option for a Viking woman, she would marry a man that was typically arranged for her by a family member, often her mother. Once in marriage however the Viking woman would have much responsibility. The Viking woman was kept in charge of the family finances, whether it was precious metals like gold or silver, or the stock of farming or animals. She would also own the keys to the family property, typically worn around her waist. Children were of course a big part of Viking life, and the women would typically marry and start a family quite young. The Viking woman was not just a housewife in the old Norse societies, she was very much involved in many aspects of life. 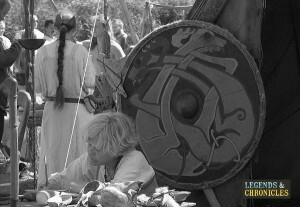 Frequently noted for their wisdom and strength in many Norse sagas of old, the Viking woman was keen for her family to receive respect in their society, and of course should her husband not achieve this he would be told to rectify the situation. This very much encompasses the Viking woman, strong and wise, while also fulfilling many important daily chores of everyday life.